Catastrophe loss data aggregator PERILS has released its final re/insured loss estimate for Extratropical Cyclone Friederike, also known as David, putting the total at €1.672 billion (US $1.91 billion). In keeping with PERILS’ reporting schedule, the final loss figure was released 12 months after the original event, and represents a slim decrease on the firm’s previous estimate of €1.675 million, released in July 2018. Friederike was a compact and fast-moving extratropical cyclone that generated strong winds in the Netherlands and Germany on 17 and 18 January 2018, and also caused significant damage across the British Isles and Belgium. 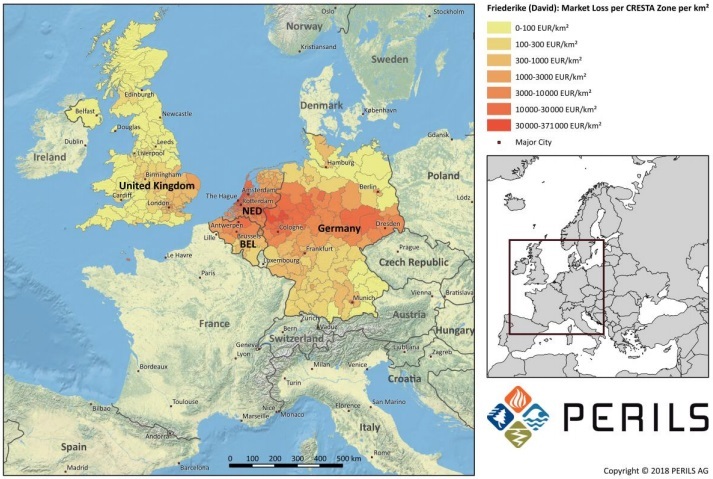 PERIL’s figure compares with recent estimates from Willis Towers Watson, which put industry losses from Friederike at $2.0 billion (€1.75 billion) and Munich Re, who said that storms Friederike and Burglind caused combined losses of $3 billion (€2.4 billion). PERILS recently finalised its loss estimate for Extratropical Cyclone Burglind, also known as Eleanor, at €756 million (US $860 million). Strong winds from Friederike caused severe damage and disruption to areas in the Netherlands and the German states of North Rhine-Westphalia, Hesse, Saxony Anhalt, Thuringia and Saxony. The storm also resulted in the deaths of eight people in Germany, three in the Netherlands and one in Belgium. PERILS noted that Friederike happened exactly 11 years after windstorm Kyrill, which generated insured losses of €3.651 billion across Europe at the time.